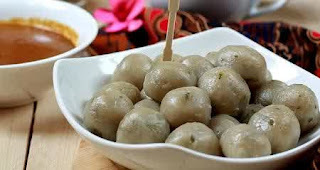 Cilok is a typical food of West Java which is made of chewy tapioca with additional complementary seasonings such as peanut sauce, soy sauce, and gravy. Cilok shape is round like a meatball, it's just different base ingredients. First, prepare a non-stick pan. Then enter the broth, garlic, salt, and pepper. Boil until the water is boiling broth using medium heat. If the broth is boiling, please turn off the stove and fill flour. Next, stir the batter until dense and clumping together using a spatula / wooden spoon. Then turn on the stove and cook the dough for 1 minute over low heat, stirring frequently. Allow the dough to cool. Continued to include eggs, starch, and onions into the batter, then stir until well blended and knead the dough using your fingers. If the hand feels sticky, do berfikiran to add flour or the like into the batter. Enough to sprinkle your hands with flour tapioca, then continue back in the process of kneading the dough until smooth. Take 1 teaspoon of dough and a round shape dough using your hands. The round shape of all the dough, then place the dough has been rounded off earlier on a baking sheet. Set the pot and fill with water. Cilok dough boiled in boiling water to float and the size becomes bigger. Next, enter the last cilok cooking water into a steamer steamer. Place the strainer cormorant, and enter cilok on it. Cilok then steamed until the color becomes slightly transparent, takes approximately 15-20 minutes. Turn off the stove and let it remain in the boiler fitch cilok to stay warm and much better in the meal. As usual, not afdol if cilok without sauce. Please also add your favorite sauce, whether it's salad or bean chilli sauce.. I think cilok fit combined with peanut sauce, savory taste hmm ..